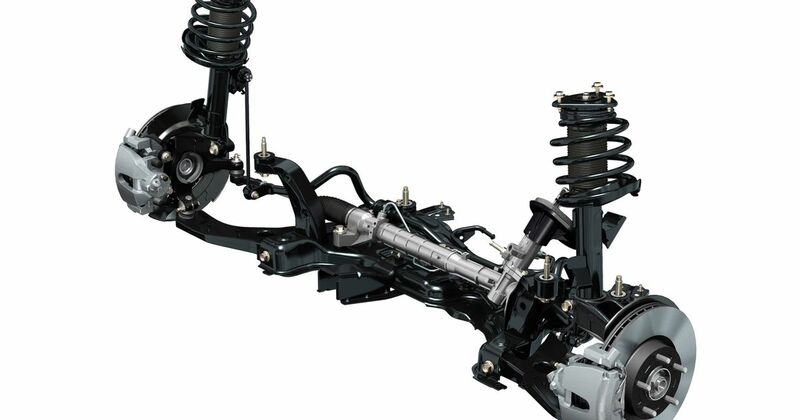 What Is MacPherson Strut Suspension And Why Is It So Popular? The MacPherson strut is the most common type of front suspension on modern cars, but what exactly is it, and why does almost everyone use it? If you’re coming into this with zero advance knowledge a MacPherson strut could just as easily be an American football touch-down celebration as a decades-old suspension design. But it’s only the latter, to the best of our knowledge, and here’s what the fuss is about. MacPherson strut suspension is a simple independent suspension design used by just about every mainstream car maker in the world, normally for front wheels. It’s based around a basic triangular design in two parts; a control arm and a radius rod, which together form a triangle against the car’s chassis. Usually, this triangle is at the bottom of the suspension rather than the top. The control arm locates the wheel laterally and the radius rod stops it moving fore and aft in the wheel arch. The control arm was usually the chunkier and stronger of the two and was the one that attached directly to the lower part of the wheel carrier, otherwise known as the hub. These days, the two have been streamlined into one, much larger, control arm in conjunction with a stabiliser bar that links the chassis and suspension unit. Speaking of which, the spring and damper unit is mounted vertically or close to it. It consists of an enclosed cylinder that bolts to the top of the hub; within it is the shock absorber or damper. At the top it has a wide collar that cups the coil spring, while the damper shaft runs all the way through the centre of the coil to the top of the spring unit, which is bolted fast to the structure of the car. In this way the MacPherson strut creates a three-point fixing structure for the wheel that proves very strong and versatile, and can easily be tailored to more demanding usage like track driving. At least as importantly, it’s also a cheap design to produce. Car makers love ‘cheap and effective’ just as much as we do. The design really came into its own as cars began to be produced with ‘unibody’ chassis, also called monocoques. Monocoques have high relative rigidity between the MacPherson strut’s mounting point areas, giving it the kind of support and control it needs in order to work properly. Various developments over the years have seen different interpretations of the design emerge, from Earle S MacPherson’s first sketches where an extended anti-roll bar also functioned as the radius rod, to current ideas where the two are separate. Some cars also now use a wishbone instead of the old control arm and radius rod combination. It’s obviously a good system. The likes of BMW and Porsche use it, and you’ll find it hiding behind the front wheels of the Golf GTI, for example. It’s not just for shopping cars, even though 99 per cent of them use the same basic design. A double-wishbone setup allows more adjustment for camber and roll centre, which can reduce body roll. It’s also a stiffer option and some people say it introduces more control to a car’s handling. The fact remains that the MacPherson strut is a brilliantly effective way to combine strength, spring and stability at a low manufacturing cost.